Protect your data from physical or logical errors, such as system failure, application error, or accidental deletion. Businesses need to ensure their cloud workloads are always available and need a reliable, easy-to-use backup solution that allows instant recovery. Backup and recovery solutions that integrate with AWS storage services offer secure, efficient, and cost-effective backup and restore capabilities, with the scale and reliability of the AWS Cloud. These services reduce operational complexity and cost and provide a conduit for AWS customers to easily implement AWS best practices. 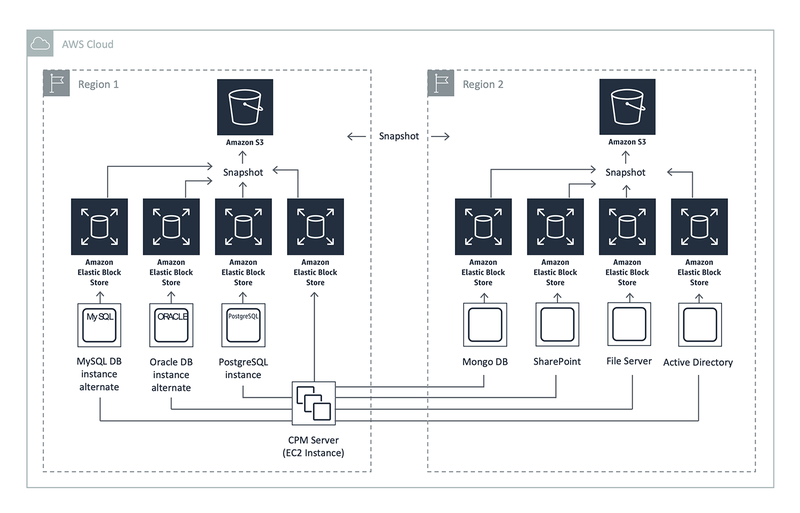 N2WS Backup and Recovery (CPM), leverages native AWS snapshot technology (incremental data backups) to enable fully-automated backup of Amazon Elastic Block Store (Amazon EBS) volumes, Amazon Elastic Compute Cloud (EC2) instances, Amazon Relational Database Service (Amazon RDS), Amazon Aurora, Amazon Redshift, and Amazon DynamoDB. It also provides one-click disaster recovery to restore a single file or your entire environment in 30 seconds. Backups are application-consistent to ensure proper restore of databases. Application-consistent backups of your critical data: Eliminate the need for maintenance windows and unnecessary downtime. Rapidly recover single files without having to restore the entire instance. Near-instant recovery time: Recover entire EC2 instances across accounts or regions within 30 seconds using incremental snapshot technology and create disaster recovery sites around the world. Low-cost data archiving: transfer Amazon Elastic Block Store snapshots to Amazon Simple Storage Service for long term retention and real time cost-savings of up to 40%. VPC capture and clone: automate regular backups of VPC settings and clone to other regions in one click. Easy-to-use interface with real-time alerts: Get reporting and integration with other services via the Cloud Protection Manager (CPM) CLI and RESTful API. CPM is also designed for multi-tenancy, allowing you to manage multiple accounts from one console. Founded in 1842, the University of Notre Dame is steeped in history—but it’s by no means stuck in the past. Fast forward 176 years and Notre Dame has adopted a forward-thinking backup strategy for its Amazon Web Services (AWS) environment. By adopting data protection from N2WS and AWS, the University of Notre Dame has paved the way for cloud-first practices, while reducing their time spent backing up and maintaining uptime. With 240 IT staff, 6k employees, and 12k students, a system fail would have meant weeks recovering data, requiring all-hands-on-deck for 12-hour shifts. That is... until the University of Notre Dame migrated to AWS, utilizing N2WS for their backup & recovery. N2WS offers a flawless solution that’s reliable. Using N2WS, I was able to find [a] lost folder and restore it to the source destination in 5 minutes as opposed to 30. In order to minimize potential down time, Goodwill uses Cloud Protection Manager by N2WS Software to protect all of its data, systems, and assets with easy-to-configure backup policies, ensuring data is recovered as fast as AWS supports launching a new instance. Before migrating to AWS with the N2WS backup, Goodwill experienced outages due to hardware deprecation. Now that it uses AWS with N2WS backup, Goodwill’s registers have been running 100 percent of the time, and Goodwill has increased uptime for its stores, schools, and offices. It is also able to back up servers hourly and restore servers within moments of failure using AWS. I needed a backup solution that did many things while meeting an aggressive RPO and RTO (up to a few minutes) and prevent Goodwill from EVER being down. I needed instantaneous restorations on failure... CPM [Cloud Protection Manager] gives me all that with the reporting I need, and delivers it at an affordable cost. Business continuity (BC) and disaster recovery (DR) technologies help businesses resume operations with as little disruption as possible. A Web application firewall (WAF) helps protect your web applications from common web exploits that could affect application availability or compromise security. A transit Virtual Private Cloud (VPC) connects multiple VPCs and remote networks in order to create a global network transit center. Monitor events in your network for security threats and stop threats once detected. Protect against data center, availability zone, server, network and storage subsystem failures to keep your business running without downtime. We&apos;re here to help you get started with AWS Marketplace. Ask for or give advice on the AWS Marketplace discussion forum.